Graham started out as an endurance runner and joined the club at the age of 26. Being an all round athlete suited the Clubs Midland League team of the mid 80’s where there was plenty of opportunity to have a go at a range of events. Most success came in the hurdles events where , self coached , he managed to achieve a reasonable county standard and represented Avon County in both 110H and 400H. All round abilities belatedly led him into Combined events competition and in the late 80’s he started Decathlon with the reward of a Midland Counties Bronze medal. Graham competed into his early Veteran years when as a Vet 40 he took a BVAF Championship Gold medal for Pentathlon and Silver medal for Decathlon in 1999. Hurdlers are essentially sprinters with an additional skill. Logistics dictate that it is not possible to effectively coach all-comers at every session. So, athletes considering hurdles as an event will be evaluated on an individual basis to determine appropriate training strategies and sessions. Factors to be considered sprint speed, agility, flexibility, physical height, chronological age, training age, ambition/focus. 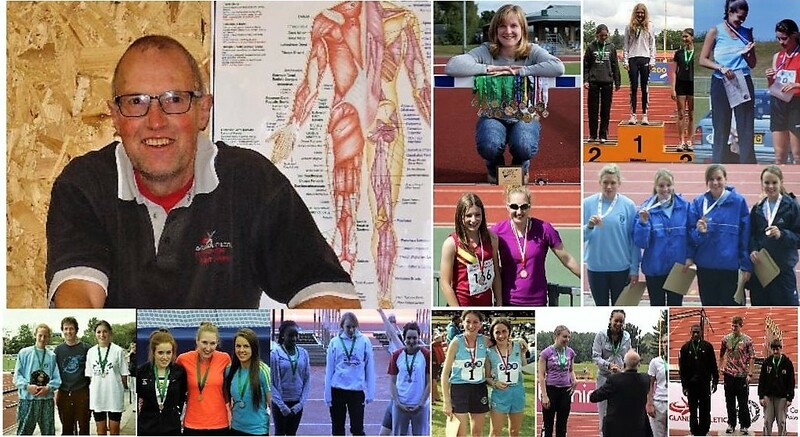 I started coaching in 1988 at Yate & District AC and took the old British Amateur Athletic Board Assistant Club Coach award for all events in the same year. Naturally as a hurdler/all rounder I focussed on coaching hurdles and combined events qualifying for both disciplines at Club Coach level before finally achieving Senior Coach level in 1997. The various coaching scheme transformations since the demise of BAAB leaves me described as Performance Coach Level 4 Hurdles and Level 3 Combined Events. If an athlete shows me focus, discipline and ambition to improve then I will gladly give them some attention and assist them to fulfil their potential whatever that might be. Beside my personal coaching I organised the UK Athletics SPAR Sprints for the South West for three years and the HI-TEC Hurdles Academy for 10 years helping to develop young sprints and hurdles talent from the South West, mentoring coaches and providing opportunity for coaches to meet and share. As a coach there is always the need to keep searching and learning. In my early days before I knew a great deal I would go to Coaching Conferences or sessions with leading national or inter-national coaches and expect to hear pearls of wisdom that would allow me to produce world beating athletes. However, after hearing coaches of Olympic athletes contradict and disagree on some topics I realised there is no template to follow, you need to gather as many views as you can and establish your own regime. For me coaching is an art and a science, after all there are irrefutable laws of Biology, Physics and Chemistry that apply as well as individual athletes to understand all of whom are different physically and emotionally. Long Term Athlete Development and developing athletes to national standards are my personal coaching ambitions. Winning medals at the various championship levels should be an important goal for athletes that I’m coaching. Medals are a tangible proof of achievement and as a coach seeing athletes get that little piece of metal can be very satisfying and sometimes emotional. Athletes are evaluated by personal bests and championship performances but we shouldn’t under-estimate the life lessons to be learnt in those tough training sessions. My first 30 years of coaching produced many notable athlete performances, many medals in hurdles, combined events and sprints, and hopefully many more to come. Currently my attention is fully on Hurdling , it would be great to have some new coaches to mentor and work with me. More coaches will improve the hurdling opportunities/pathway for our club athletes.